- Air Rescue Rocky is ready for a high-flying rescue with his transforming Pup Pack! 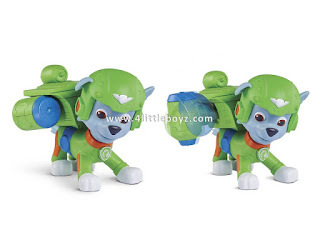 - Press the button to transform Rocky's Pup Pack into wings! When it's time to pack up, the wings easily transform back into the Pup Pack. - Collect the new Air Rescue Skye, Chase, Marshall, Zuma and Rubble Pups to help out with the rescue! - Air Rescue Pups are for kids ages 3+. Batteries not required.